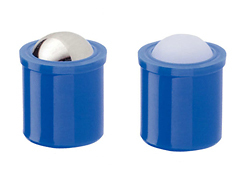 POM Plastic Ball Plungers / Spring Plungers with POM plastic body and stainless steel spring/ball, size Dia. 3mm – 12mm from China spring ball plungers manufacturer. Ball lock detent pins, by one or two steel locking balls.